I’d forgotten that for much of the Northern Hemisphere that today is the first day of Spring, 1st of March . I grew up learning that Spring (or Autumn in Australia) started on March 1st but when I arrived to the US I was told I had been misinformed. Here in America people understand Spring to start on March 20, nearly 3 full weeks after I did. According to the Farmer’s Almanac we are all correct (much like #thedress – we are all right. Huzzah!). Here’s why. The differences in the dates have to do with whether you are speaking Astronomically or Meteorologically. If you are in to the stars and have an Astronomical view of the seasons (as it turns out Americans do) then you are looking for Spring to start on the Vernal (Spring) Equinox, when there are the same amount of day and night hours in the day – which this year is on March 20. If you are in to the weather and look to annual temperature cycles instead of the position of the earth relative to the sun, as is the rest of the world, then Spring for you starts on March 1. Since I’m on team ‘Rest Of The World’ my Spring starts today. I’ve got to say, it doesn’t feel much like Spring. We’ve had snow in Charlotte (!!) this week, more snowdays and delayed school starts for the kids, cold cold temperatures, freezing rain, and burst water pipes. Good times good times. But I have seen bluebirds over the last 10 days or so, particularly when I’m on my long runs early on Saturday mornings. And I have seen daffodils blooming. My apple trees have been putting out buds and the crocuses are doing their crocus thang. All definite signs that Spring is near. 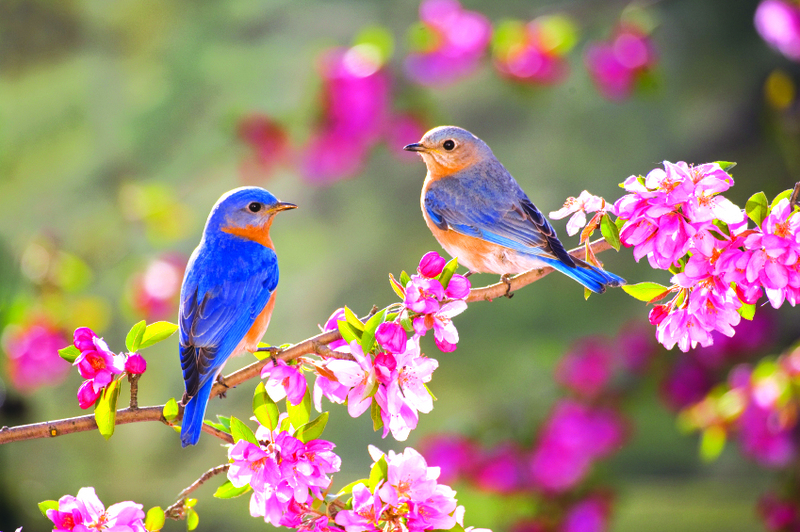 Spring is also the time when worms begin to emerge from the earth, ladybugs land on screen doors, green buds appear, birds chirp, and flowers begin to bloom. Is it Spring yet for you? Or Autumn for my Antipodean buddies? What signs of Spring have you seen? Do you think you can say Spring has come if you can only find 8 daisies to crush under your foot? I am with you, Autumn starts on the 1st of March in Australia. But now I feel silly as I have wished many American gardeners a ‘happy spring time’ when they are probably thinking “I have 19 more days”. Love your Blue Bird photo!